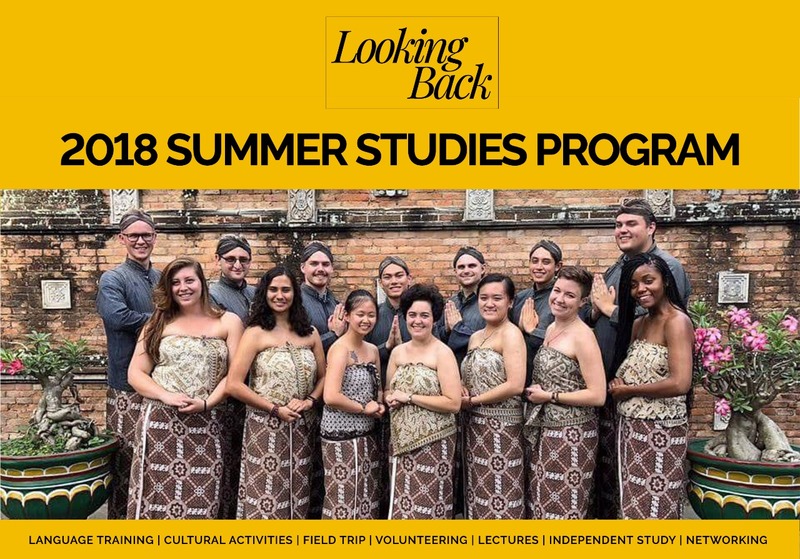 2018 Summer Studies Program has just concluded in August. 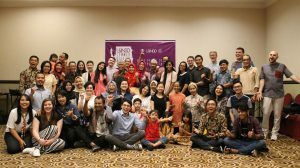 The USINDO Summer Studies Program has been our core educational program providing young Americans with in-country language and cultural experience in Indonesia. The rigorous 10-week program, conducted in Yogyakarta and Jakarta, includes intensive Bahasa Indonesia language class, volunteering, cultural workshops, special lectures, field-trips, and staying with a host family. As it enters its 24th year of implementation, USINDO is proud to have 227 alumni of the Summer Studies program. The experience provides American students with a deeper understanding of Bahasa Indonesia, cultural sensitivity, and sociopolitical awareness. 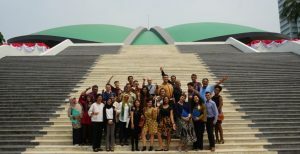 Many have returned to Indonesia for employment, conducted research on Indonesia, or otherwise benefitted from this program to build their future careers and deepen their interest in this increasingly significant country. In 2018, USINDO hosted 14 American students from various universities in the United States for the Summer Studies Program. Participants ranged from undergraduate seniors to master’s students, between age 19 to 30. The program ran for approximately two months - from May 24 to August 2. This program is made possible by the generous contribution from The Freeman Foundation and USINDO, and is in partnership with Purna Caraka Muda Indonesia (PCMI) Yogyakarta and Indonesian Language and Culture Intensive Course (ILCIC) of Sanata Dharma University Yogyakarta. Our Summer Studies Program is meant for students looking for immersive exposure and training on Bahasa Indonesia. Through tutoring sessions and various other activities, the program also gives a chance for Indonesian students to interact with and learn from their American counterparts. 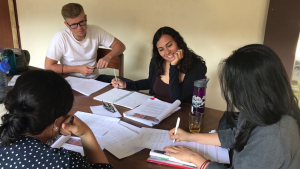 The students attended Bahasa Indonesia Language Class for 120 hours for 10 weeks, covering essential vocabulary, grammar, and cultural contexts through interactive speaking, reading, writing, and listening exercises. The students were divided into 5 classes based on their level of fluency. To make sure the learning is customized, the students have one-on-one tutorial sessions and an opportunity to adjust their classes based on their progress. Cultural immersion means that students have a chance to interact with locals in a professional capacity by volunteering in a variety of local organizations – from notable retail business, local NGOs, to think-thanks. We handpick worthwhile opportunities, so that students can contribute meaningfully in the institutions they choose to volunteer in. – Megan Miazgowicz, Summer Studies ‘18. Megan contributed to the rebranding of a product package for a well-known local confectionary in Yogyakarta, Coklat nDalem. Through independent study, we support students who want to explore their interests more deeply. Each student interviewed academics and experts relevant to their topics. This year, three students pursued different topics, including the comparison between western and eastern approaches to medicine (study case: jamu), imaginative history-making through art and feminism in Yogyakarta, and landscape architecture of an urban Kampong in Yogyakarta. During field trip, the students spent three days discovering Yogyakarta' renowned and historical places. 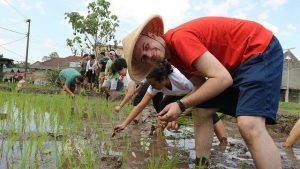 This year, the students saw firsthand Yogyakarta’s unique culture, history, tradition, organic farming, belief system, and natural wonders. Sites include the famous Merapi Lava Tour, Kotagede, Prambanan Temple, Tugu Yogyakarta, Keraton Palace, Borobudur Temple, and many more. Cultural workshops are designed to encourage students' appreciation and understanding of Indonesian culture. 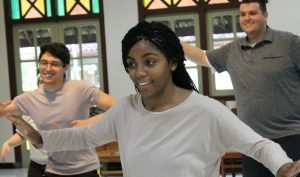 This year, our students played the traditional Javanese instrument gamelan, made batik through traditional textile dyeing techniques, learned traditional Indonesian dances, and cooked Indonesian cuisine. By doing these activities, the students could have firsthand experience on Indonesian culture. "...great educational opportunity! I can't wait to start cooking Indonesian food at home." Having a host family experience is one of the key reasons our Summer Studies program stands out as culturally immersive. During the program, our Summer Studies students live with their host families for 10 weeks in Yogyakarta. The experience is intended to reinforce language studies during the day at home, while also allowing students to experience the day-to day Indonesian household and family activities. The experience allows Indonesians and Americans to engage with each other at a deeper and more personal level, creating a lifelong friendships. Lectures are held bi-weekly and touch upon topics in various fields with an emphasis on current issues, keeping in mind students’ fields of study and interests to craft a customized and enriching experience. This year, the students had in-depth discussions with: GKR Hayu, Princess of Yogyakarta Sultanate; Prof. Dr. Moh. Mahmud MD, Professor of Law Studies at Islamic University of Indonesia; Prof. Ir. Achmad Djunaedi, Professor of Architecture Engineering at Gadjah Mada University; I Made Andi Arsana, Lecturer of Geodetic Engineering at Gadjah Mada University; and Renate Arisugawa, Member and Former Chief of PLUSH Organization. After 10 weeks in Yogyakarta, our Summer Studies students get to experience Jakarta during our Post Program, designed to get in-depth knowledge and exposure to contemporary issues facing Indonesia by visiting renowned historical sites and networking with experts and academics in the public, private, and third sector. This year students discussed contemporary issues with high-level speakers, including: Amb. Joseph R. Donovan, U.S. Ambassador to Indonesia; Dr. Mari Elka Pangestu, Former Minister of Trade and Former Minister of Tourism and Creative Economy; Hon. Fadli Zon, Deputy Speaker of House of Representatives; Dr. Douglas Ramage, Chief Representative of Indonesia at Bower Group Asia (BGA); Ms. Fenessa Adikoesoemo, Chairwoman of Museum of Modern and Contemporary Art in Nusantara (MACAN Museum); Mr. Andika Putraditama, Mr. Satrio Wicaksono, and Mr. Adi Pradana from World Resources Institute (WRI); Ms. Sita Aripurnami, Co-Founder and Executive Director of Women Research Institute; and Ms. Yuli Rustinawati, Founder of Arus Pelangi. If you want to know more visit our Summer Studies Page Here! Read more at out Students Blog and our Testimonials page. Check out our Flickr to see more about the programs. We are looking for students invested in lifelong learning and opportunities to contribute to the world! Interested in joining our Summer Studies program? USINDO is accepting applications all year long. The 2019 Summer Studies program application is currently open and updated on our website. Interested in contributing and collaborating with our program? Click here!